Walter M. White was born in Princeport, Colchester County, Nova Scotia on October 25, 1914, the third son of Morton and Sarah (Foley) White. He was orphaned at a young age and was raised by Hiram and Ruth Dalrymple of Kennetcook, Nova Scotia. On September 19th, 1939, Walter married Margaret "Ellen" Blois of Gore. They resided in West Gore for 27 years and had four children: Donna (died at age 2), Delta, Donald, and Marilynn. Walter and three of his foster brothers, Arthur and twins Eden and Elbert, were all in active service during World War II. The following account is a combination of information taken from family scrapbooks, newspaper clippings, and Walter's own words as told to his younger daughter Marilynn White. This Wall of Service plaque was placed by Marilynn in honour of her father and in loving memory. "It was in West Gore when a soldier stopped to speak to me just outside of Eddie Mason's hardware store. The soldier asked if I would like to join the army. I told him I thought it would be a great idea. He took my name and told me he would be in contact later. This soldier turned out to be Capt. Lane of the Halifax Rifles. So at the age of 24, I enlisted with the Halifax Rifles. While there I attended the Nova Scotia Technical College for six months and became a qualified Topographical Draftsman, Group A, Class 1 papers. They immediately promoted me to Lance Corporal - this meant another $3 to $4 a month. Ellen and I lived at Annie Scott's house in the Hydrostone area of Halifax during that time. Our first daughter, Donna, was born on July 2nd. I was not allowed to see my wife and daughter until four days after her birth. We were on special duty down at the Pier on the waterfront where light planes were being congregated for official shipment and security was very tight. Then the Halifax Rifles were split up. My squadron was moved to Mulgrave where the outfit got its first motorcycles. Having an old Harley Davison that I had bought in Walton, and by that time my Sergeant stripes, they put me in charge of motor cycle training. We set out practically every day for short runs. We were then under the English sergeant, Sgt. Pratt. He was tough. He would take us out on training schemes, bury himself in dry leaves and we were to find him. Eventually Sgt. Pratt retired and I became Intelligence Sergeant. My motor cycle crew were out on training one Sunday in Mulgrave when the Colonel's car appeared. He was looking for me. A submarine had been spotted surfacing outside of Canso. He instructed me to leave immediately and take a runner with me, not to see how fast I could get there, but just to get there. My bedding and supplies would be sent the following day. It was the spring of the year and the roads to Canso were terrible. However, we eventually got there safely. After a few days of investigating, the submarine turned out to be a whale surfacing. I was sent from Cape Breton to Debert for a short time, and then shipped to Camp Borden in Ontario for tank training. Among other things, I took up boxing and eventually became a boxing instructor. I had two unique entries in my pay book. One was a qualified boxing instructor and the other was a Topographical Draftsman, Class A. Still remembering I was a member of the tank corp, we went into tank training vigorously. In November, I was promoted to Corporal and qualified at Advanced Driving and Maintenance School. I was then promoted to Sergeant in December 1941, and to Squadron Quarter Master Sergeant in December 1942. While I was there I got word that little Donna had died of pneumonia, so I immediately left for home. That was a sad time. I proceeded overseas in June with the Halifax Rifles that had been converted to the 23rd Army Tank Regiment. I was selected to attend Sandhurst Military College in England where I graduated and received my commission as a two starred First Lieutenant. Part of the training at Sandhurst required climbing to the top of Mount Snowden, the highest point in England. As well, with my qualifications as a mapmaker, we used to fly over England spotting defects in camouflage. For instance, if someone were out shaving with a mirror stuck in a tree, you would give the specifications and report it to the ground for immediate action. I got promotions to a Quarter Master Sergeant, then to Sergeant Major. There was a Colonel Obbie O'Brien in charge of field training for tanks. He invited me to become an instructor on his field training program, which I accepted and was posted to a field training squadron of tanks consisting mostly of English Sandhurst cadets and likely-to-be ones. I had a full squadron of tanks staffed by the above mentioned, which presented lots of problems. 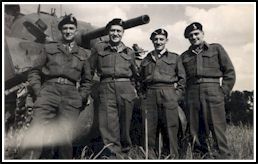 I joined active service in Holland as Troop Commander for "B" Squadron of the Sherbrooke Fusiliers, which meant I had four tanks under my command each with its own name starting with the letter "B" - Barbara, Be Good, Bohunk, and my personal tank "Bomb". The tank Bomb and the Sherbrooke Fusiliers fought in every major battle in the campaign through France, Belgium, Holland and Germany, even against Hitler's dreaded "SS" squad. You sometimes had to put your life at risk by coming up with innovative techniques to ensure the safety of the troop while at the same time furthering the campaign. On one occasion I was part of several companies that were the first to cross the Rhine River. We were camped in the Hochwald Forest. I decided that someone should take a look at this Rhine River before we got there to see what we might be up against. So I slipped out in the evening on my own. When I got to the river all I could see was this great expanse of water - it seemed like it was miles across. All I could see were the tops of church steeples in the town beyond. So it ended up that we had to float the tanks across the river. We filled all the holes and cracks of the tanks so they would be waterproof and then wrapped them round and round the bodies with compressed air hoses. When we got the word to proceed in the morning, we were ready. We were able to float the tanks across the river. Bomb missed the landing spot with the rest of the company so I had to land it at the next spot downstream. The enemy wasn't far off, not expecting us to cross, and we were able to proceed with the campaign. I was wounded in the right leg by a piece of shrapnel during fighting in Deventer. Although I was sent to hospital in England, I made my way back to Holland where I rejoined my regiment. Bomb had continued fighting, on through northwestern Holland and back into Germany until the end finally came - VE Day. Bomb's crew had traveled 2,500 miles and fired 6,000 rounds of ammunition. After the war was over all of the tanks were stripped and landed in a junkyard in Belgium. A daily logbook was kept with each tank. The War Office in London, England was going through these books looking for statistics when they discovered the logbook of tank "Bomb". Well, they really had something! The tank "Bomb" was the only one of hundreds of Canadian-built Sherman tanks that landed on the beaches on D-Day and went through the entire European campaign and was still in action on "VE" day. It had crawled stubbornly across northern Europe from the Normandy beaches deep into Germany without once being knocked out of action or being out for repairs. 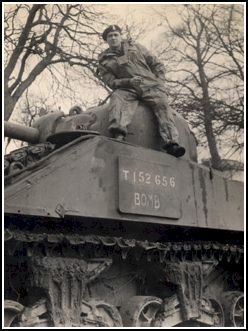 Although the tank received some minor damage through enemy action, all the necessary repairs were made on the spot by the crew themselves. "Bomb" was immediately recovered from the junkyard and sent home. In fact, the tank was back in Canada months before I was. During my time overseas, I was billeted with a family in Holland. They were wonderful. We exchanged letters for years afterwards and I was fortunate to be able to visit them once again in 1966. For a long time after the war ended Ellen and I would undoubtedly receive a box of tulips in the mail every year. We always had beautiful tulips at home in West Gore thanks to our friends in Holland." At this point, Walter was unable to go on. His daughter, Marilynn, said that her father would never talk about the war years earlier on. It wasn't until after her mother's passing in 1990 that he shared with her these stories - other scenarios were too difficult to relate. 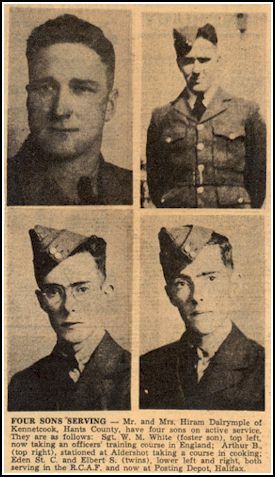 Walter returned home aboard the ship Lady Rodney to Pier 21 in Halifax accompanied by other members of the Sherbrooke Fusiliers and the New Brunswick: Sgt. 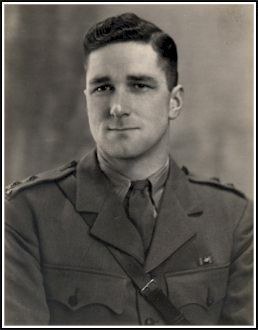 R. J. Dauphinee, Halifax; Cpl. R. Heighton, Pictou; Cpl. R. Ulrich, Glace Bay; Tpr. J. A. Martell, L'Ardoise, Cape Breton; Cpl. Jack White, Amherst; Cpl. G. G. Burden, Bridgewater; and Tpr. Wallace Whynot, Liverpool. Marilynn described how her father returned a decorated officer, but when interviewed by the press, it was of far more interest to him that the tank Bomb had been through every major battle and had put in twice the life of a normal tank. He spoke of the tank and its men with pride and respect as he recalled its history. Included in Bomb's crew were Lieut. Ernest C. Mingo of New Glasgow, Nova Scotia who took over command when Lieut. White was injured; Tpr. A. Rudolph, gunner; L/Cpl. Rudy Moreault, and Tpr. Ken Gerrow, co-drivers; and Tpr. J. W. "Tiny" Hall, loader operator. Another comrade and friend, Sgt. Atkinson "Atkie", did not survive the Battle of Zutphen and was buried at Almen, Holland. Atkie was a good friend and comrade of Walter's. A film record of the tank entitled "The Green Fields Beyond" was made commemorating it as a proud symbol of the Royal Canadian Armoured Corp and its gallant crew. The tank "Bomb" did not lie forgotten in a junkyard, but returned home to Canada with the Regiment to whom it brought honour. Walter had mentioned the tulips - a gift gratefully sent every year from his friends in the Netherlands. Marilynn also remembers the tulips. And she remembers the hard working, proud, and honest man her father was; a man of few words who was well liked in his community and by the men who worked with him. He was superintendent with Tidewater Construction for many years. He was also a Mason, a Shriner, president of the first Legion in the area, and a municipal councilor. As well, her father and mother were co-owners/operators of White's General Store in West Gore for 27 year where her mother was also the community postmistress. Lieut. White's dress uniform now stands at proud attention on the World War II Deck of Pier 21 National Historic Site; the very dock where he departed for the unknown of World War II and where he arrived safely home aboard the ship Lady Rodney. As for the tank, Bomb, it rests peacefully as a war memorial in Sherbrooke, Quebec. Lieut. Walter White and Ellen, his devoted wife of 50 years, rest peacefully as well in a quiet, little cemetery in Gore, Hants County, Nova Scotia. And daughter Marilynn will tell you that if you visit in the spring of the year, you will undoubtedly notice the beautiful Dutch tulips gracing their resting place - back home again.